We collect your parcels and letters in your name to avoid high Swiss shipping costs and customs charges that are increased by many online shops. You do now have a personal account with an overview of all incoming deliveries as well as a list of all deliveries already picked up by you. Tuesday to Saturday from 10 to 22 o'clock you can come and pick up your deliveries. We calculate our prices in Euro, therefore, our prices in Swiss Franc may vary. Please see our terms and conditions (German) and our storage times. 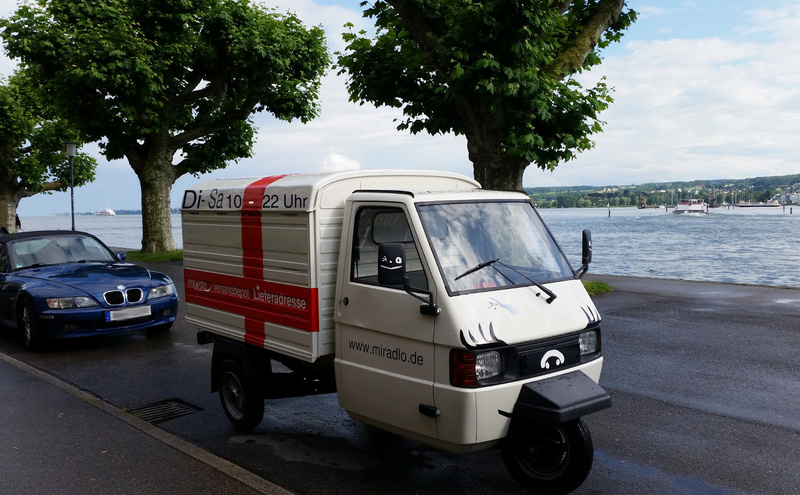 Cash on delivery (COD) charge 5.00€ 6.25 CHF Only if announced and prepayed, same will be charged for deliveries with identification proof. Cash on delivery (COD) charge without advanced notice 10.00€ 12.50 CHF We only accept unannounced COD in special cases for well-known customers but with an extra charge only. Investigation charge 5.00€ 6.25 CHF If receiver cannot be identified clearly we charge extra costs for our investigation time. Additional infos to shipments 2.50€ 3.15 CHF We inform about shipments including sender and size of the package. For additonal infos to a shipment e.g. a photo we charge extra costs. Return shipments D without labeling - DHL 5.00€ 6.25 CHF Return shipments without labeling in Germany can be sent via our parcel shop but we have to collect this extra charge plus shipping costs, if we have to readress the shipment. Return L to palett 15.00€ 18.75 CHF We accept return pallets or other shipments, but we charge storage costs for shipments >= size L.
Forwarding charges to Switzerland 15.00€ 18.75 CHF It is exceptionally possible to forward your parcel to Switzerland but because of our extra work we have to collect this extra charge plus shipment costs. Return shipments with labeling free of charge Return shipments without labeling can be picked up by DHL but we have to collect this extra charge plus shipping costs. Shipments that cannot be stacked Shipments that cannot be stacked, e.g. buckets or something similar, are charged with at least 100 cm height plus length. Parking free of charge Free car parking nearby, we can provide a trolley for the transportation to your car. Parking in front of our door is possible for big deliveries. Our prices are valid for parcels up to size L, that are picked up within one week (5 open working days of miradlo-Versanddepot). For bigger shipments up to half a europallet prices are valid for two days only. For shipments bigger than half a europallet our prices are valid for a pick up on the delivery day only. storage costs: we impose an additional charge of 1/5 of the original delivery price for every further day. storage costs: we impose an additional charge of 1/4 of the original delivery price for every further day. storage costs: we impose an additional charge of 1/2 of the original delivery price for every further day. storage costs: we impose an additional charge of 3/4 of the original delivery price for every further day. storage costs: we impose an additional charge in the amount of the original delivery price for every further beginning day. storage costs: we impose an additional charge in the amount of the original delivery price for every beginning day. Any possible exceptions of our prices can of course be discussed in advance. Later price adjustments are not possible. This is also valid for storage costs. Therefore, please contact us immediately after you have received our delivery message if you are not able to pick up your goods within the agreed storage time. Even then we will try to find a solution. Information about Import Conditions into Switzerland can be seen in Eidgenössische Zollverwaltung EZV (German). Information about Export Conditions from Germany can be seen in Deutscher Zoll (German). Questions about the refund of Value-Added-Tax (VAT) (Mehrwertsteuerrückerstattung) always have to be cleared with the seller in advance. You can find more information about the refund of VAT in our blog (German): Wie funktioniert die Mwst-Rückerstattung in einem Onlineshop?. Some questions regarding our Versanddepot are given in our AGB, i.e. general terms and conditions (only in German). it is absolutely important to indicate the correct delivery address. Depending on delivery services we do also receive incorrect addressed deliveries. 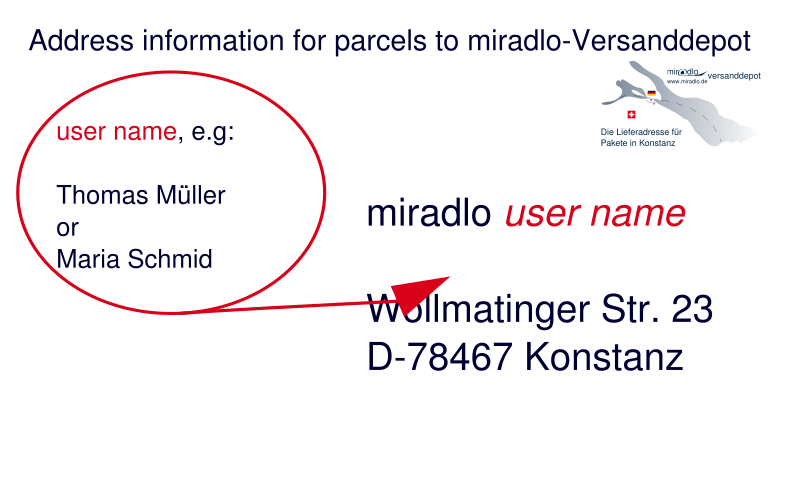 However, if you miss to indicate 'miradlo-Versanddepot' or a wrongly written house number a return to sender is possible. If the user name is written wrongly we receive the parcel but are not able to inform you as we do not know to whom it belongs. 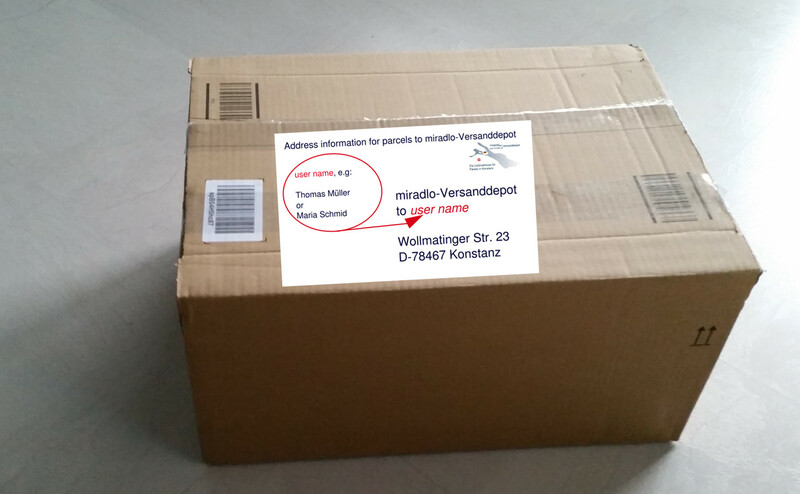 Therefore, we have to open the parcel to find out if documents inside can give us the necessary information. But sometimes there aren't even documents inside. 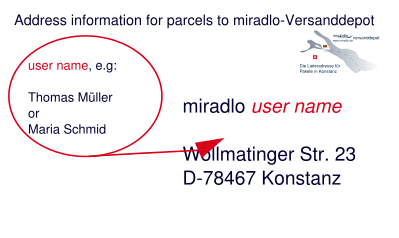 Some senders do not use the originally indicated delivery address and only parts of the user name. In case of unusual names we are anyway able to find the related recipient. For common names we ask all customers with same (first) name if they are the receiver of the delivery. A wrong address or user name always leads to a delay in informing the receiver about an incoming parcel. Delivery address (Lieferadresse), dispatch address (Versandadresse), border parcel (grenzüberschreitende Pakete), dispatch depot (Versanddepot), parcel service (Paketservice)? We will help you with all questions about each single term. German receiver addresses for Swiss people, do have our German address as delivery address but the home address of the Swiss customer as invoice address. Therefore, the term grenzüberschreitende Pakete (border parcel) is frequently used because the parcels are addressed transnationally. Tips for all topics around the delivery address are given in our blog Lieferadressen-Tipps (German). Register yourself free of charge and become a customer ⇒ you do now have a personal account with an overview of all incoming deliveries as well as a list of all deliveries already picked up by you. Please take care, the following version must not be used if you have just one line in address form: e.g. 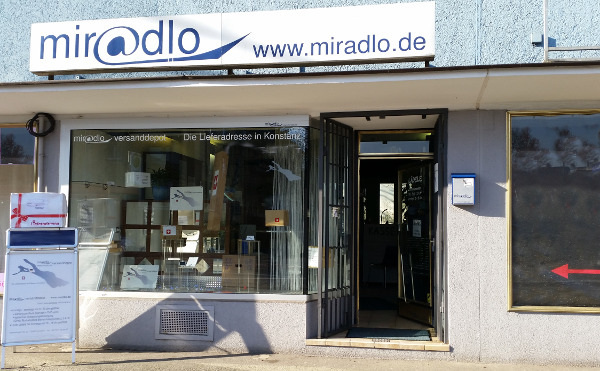 miradlo-Versanddepot z.H. Benutzervorname Benutzernachname does not work. Printers will shorten it to just "miradlo-Versanddepot z.H." in theses cases we don't know to whom the parcel belongs. (Invoice address usually is your postal address in Switzerland) . You can use the user name you like, as long as you choose a name which is unique for our system. Of course, you can also use our contact form. Please be aware that not all of our staff understand and speak English very well. The safest way to get an answer in English, is writing us. You would like to reach us by another channel? Please let us know, we would be glad to add another way to contact us. The map shows where you find miradlo, Wollmatinger Straße 23, Konstanz. To reach us via public transport (ÖPNV Öffentlicher Personen-Nah-Verkehr) use the bus 2, 3, 12 and 12/3 to the bus station Bismarcksteig. The bus schedules of Konstanz you will find on the website of Stadtwerke Konstanz. During the day every 5 minutes a bus starts and arrives. May be some of our German information helps as well, then see our blog: Lieferadressentipps. If you have questions do not hesitate to contact us. Please be aware that not all of our staff understand and speak English very well. The safest way to get an answer in English, is writing us.